Welcome to the ACCUPLACER practice test page. The links below will help you take our sample ACCUPLACER practice test. These practice questions will give you a better idea of what to study on your exam. If you need additional practice questions get our ACCUPLACER study guide and flashcards. Upgrade to our best ACCUPLACER study guide and flashcards resource. What is on the ACCUPLACER? There are six sections on the ACCUPLACER exam: Arithmetic, College-Level Math, Elementary Algebra, Reading Comprehension, Sentence Skills, and a written essay. Can you fail a placement test for college? No, you cannot fail a placement test. However, a placement test will determine what courses you will need to be placed in when you begin college classes. Are you allowed to use a calculator on the ACCUPLACER? You are allowed to use a calculator on the ACCUPLACER. However, you are not permitted to bring your own personal calculator. There will be an on-screen calculator provided for you. How long does it take to do the ACCUPLACER test? The ACCUPLACER is an untimed exam. This allows you to work at a pace that is comfortable to you. Is the ACCUPLACER multiple choice? The ACCUPLACER is a multiple-choice test. The numbers of questions on the ACCUPLACER vary depending on which ACCUPLACER you are taking. There could be as few as 12 questions or as many as 40 questions. What is ACCUPLACER test for? 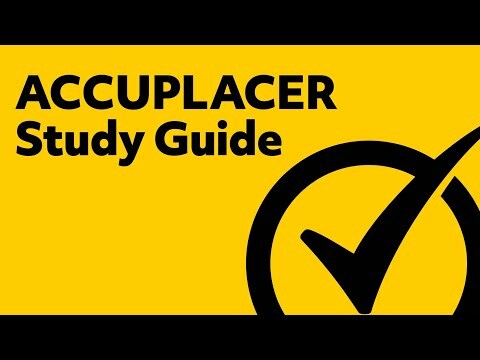 The ACCUPLACER exam uses your scores to help place you where you would be most likely to thrive in college, assessing which classes would be best for you. How many questions are on the ACCUPLACER math test? There are 60 questions on the ACCUPLACER math test. What does ACCUPLACER test stand for? ACCUPLACER does not stand for anything, but is a mix of the words accurate and placer. This is because the test aims to accurately place students in college classes they would thrive in. How long does it take to complete the ACCUPLACER? Additionally, many ACCUPLACER practice tests have a section explaining the answer choices. It can be tempting to read the explanation and think that you now have a good understanding of the concept. However, an explanation likely only covers part of the question’s broader context. Even if the explanation makes sense, go back and investigate every concept related to the question until you’re positive you have a thorough understanding. As you go along, keep in mind that the ACCUPLACER practice test is just that: practice. Memorizing these questions and answers will not be very helpful on the actual test because it is unlikely to have any of the same exact questions. If you only know the right answers to the sample questions, you won’t be prepared for the real thing. Study the concepts until you understand them fully, and then you’ll be able to answer any question that shows up on the test. On test day, you’ll need to be prepared for answering ACCUPLACER questions, managing your time, and using the test-taking strategies you’ve learned. It’s a lot to balance, like a mental marathon that will have a big impact on your future. But like training for a marathon, start slowly and work your way up. When the test day comes, you’ll be ready. Take the first test with no time constraints and with your notes and ACCUPLACER study guide handy. Take your time and focus on applying the strategies you’ve learned.